Unfortunately hate has accompanied humanity from its beginnings and despite all the evolution, the technological revolution and the further understanding it seems that hate remains there, strong without cure. Actually I am of the opinion that the new forms of hate were always here, we just never had seen them exposed so much. Social phobias were always here and they were often turned into hate. Homophobia was always high, it was when I was growing up in 1960s and it was strong when my father grew up in 1930s. Actually it was strong in Victorian times, in the Middle Evil era and despite all the myths was strong in ancient Athens. I suppose what has changed nowadays is that it got a more sophisticated name and we are talking about it trying to find ways to fight it. Islamophobia was also always here in the west. It was just that in the past, Muslim visitors in the west were few and their unusual - for the west - clothes, their polygamy, their traditions and their praying habits made them exotic. For long and for the most, they attracted curiosity, not hate. So it is not true to say that 9/11 triggered Islamophobia. The countries neighbouring the Ottoman Empire always suffered from a form of Islamophobia and most of all the countries occupied by the Ottoman Empire. The enslaved populations connected their occupant with its religion. After all that was their main and obvious difference. Countries like Spain that had direct contact with Islam for long periods and gradually, created a relationship and tolerance. For the rest of the Europeans and the Americans, Muslims remained exotic and in most cases cheap labour that never complained. I think another noticeable factor is that unalike the Asian or African immigrants to the west, Muslim immigrants never created societies, associations, unions, clubs even ghettoes. They somehow always disappeared in the multi-collective crowd of immigrants and foreigners. The first western country to feel the rise of Islamophobia was Germany in mid 1960s with the big wave of Turkish immigration. So the first stereotypes in modern times in the west were made from Turkish immigrants who were Muslims and not really based on their religion. While the fear of a religion that veils women and lets men use them as something minor was there, it was more the hate for the different that attracted the hate. The first signs of Islamophobia appeared in 1970s triggered by the terrorist attacks of Palestinians organizations against European targets but still it wasn’t widely spread since most connected terrorism with the Palestinians and their conflict with Israel. The same time we have the first Islamic state, Iran and the first signs that the enemy is not Christianity or just the west but whatever the west represented as a way of life including secular representative democracy. But this is also the period when extreme preachers appear in the Muslim world placing the west as their ultimate enemy. Despite theories of war of faiths as 9/11 later proved it was nothing to do with religions, it was radical Islam against anything that didn’t support their ideals. 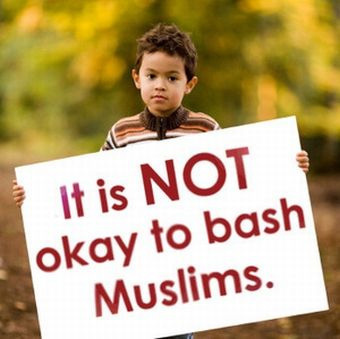 Without any intension to excuse anybody, or playing the blame game I think that while we are talking about Islamophobia in the west, the period, prior to 9/11, a western-phobia was in process fast in the Muslim countries. West became the other side of the moon for most Muslims where prejudices for the western unethical life full of sins became stereotype. For most of the Muslim world the west was nothing more than Sodoma and Gomorra and following god’s orders should be vanished form the face of the earth before it will destroy the rest of the world. Unfortunately stereotypes have nothing to do with clash, education and money but mainly with information and when most of your information is coming from preachers, media, politicians or “experts” who intentional misinform the result is what happens now. Islamophobia conquers the west while West-phobia takes over Muslim countries. In the end it is not the hate preachers from both sides who pay the cost but simple people and the ones blamed are again not the hate preachers but brainwashed victims of those hate preachers. I think that the hate preacher who was burning the Quran in USA a year ago – I think – should serve time in prison for provoking hate crimes and I think that the same accounts for the preacher in UK who was blessing a few years ago the bombers in the tube. I think time has come to change our perspective on how to deal with Islamophobia and place all our weight in information. Islam is not a religion of hate neither is Christianity in their fundamentals but the preacher in USA and the Imam in Baghdad have made it paraphrasing their holy books led by their hate instincts. The latest expression of hate in Europe and USA is demonstrations demanding the closure of mosques or the ban of building new ones. The excuse is that certain Muslim countries forbid the practice of Christianity and ban Christian churches while many seem to believe that mosques are gathering places for terrorists and extremists. For the later the only thing I can say is that there are churches in USA and Europe that preach hate, violence against Muslims and they do it in churches using the bible as their excuse. Does that mean that we must ban further building of Christian churches because they create racists? As far extremisms and terrorisms we all have read about hate crimes from Germany to UK and from USA to Poland. Coming to the argument about Muslim countries forbid the practice of Christianity apart from the fact that I find it a totally idiotic argument I would suggest to the ones who use this argument to read the Bible and leave the eye for an eye to the Old Testament. The World Day of Muslim Culture, Peace, Dialogue and Film is one of the best chances to start informing using the best way to do it. Art. Art is created and inspired from understanding, tolerance, peace and love. This day marks that Islam is not bombs, guns and rockets. Islam is theatre, is poetry (as the Quran actually proves), is paintings and sculpturing, is carving and music; is creations and inspiration because it is people. So it is all about Information against hate and murder and not Islamophobia versus Western-phobia. It is about us as humans and not us and them. It is about the whole and not the few. It is about Thanos and Amir and not about EU and Iran. And definitely it is not about psychotic murderous mercenaries like the IS and the Boko Haram. Plenty of food for thought here. On this issue, as regards the proposed ban on the building of mosques in the Italian region of Lombardy, are we to be greatly surprised? This is the same region, after all, wherein the Lega party is thriving with the intent of eventually separating from Italy inventing out of the ble the Padan people in contrast to the Italian people, never mind European cultural identity. In reality they have made themselves special and superior “people,” a super-race, to better argue for the inferiority of all the other, it’s us against them, and that them includes Italian Christians or Jews or Moslems. In effect what is proudly and shamefully being paraded is a reprehensible racist ideology having precious little to do with Christianity or religion per se. In fact the new religion on Sundays is now Soccer games on Sunday which are well attended while the churches remain empty; on the other hand, the mosques with minarets are well attended on Fridays; sometimes those mosques happen to be abandoned Christian churches acquired and transformed by Moslems. Think of the Hagia Sophia. So, the problem at its root appears to be cultural indeed; the fear of losing culturally what was won on the battlefield or politically. There is little doubt that the ugly fear and hatred and intolerance of one religion against another is a clear symptom of ignorance of one’s own cultural roots; for those who know who they are culturally are secure in that knowledge and need not demonize the other, as Emanuel Levinas has well taught us.